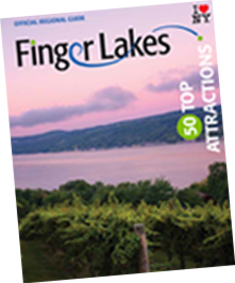 Calling all outdoor adventurers, culture connoisseurs and city slickers - the Finger Lakes region is inviting you to come explore. There’s so much to see and do, you will run out of time before you run out of activities! Fill your days on the water – there’s plenty around – with swimming, boating, paddle boarding and more! Take to the trails and hike through some of the area’s most impressive parks, including Letchworth State Park (“The Grand Canyon of the East”) or Watkins Glen State Park. Get your adrenaline pumping as you zipline over the tree tops at Bristol Mountain or climb through Greek Peak’s Outdoor Adventure Center. As a four-season playground, we never slow down! We welcome winter with skiing, snowmobiling, ice skating and outdoor festivals and an occasional ‘hot-toddy’ at one of many watering holes. Here, our arts and culture scene is as rich as our soil. Enlighten your senses with world-class theater productions, impressive art installations and mesmerizing musical performances. We’re also home to so much history - from Native American roots to the equal rights and women’s suffrage movements. The Finger Lakes has been the landscape for significant battles, the inspiration for movies and books and the leader of technology and innovation. Learn about the events, inventions and people that shaped this area through interactive museums and exhibits, or step back in time at the Genesee Country Village & Museum to experience earlier ways of life yourself. For the city-life atmosphere, Rochester and Syracuse are the spots to be. With walkable downtowns, you can easily explore a historic site, catch a show at an ornate theater and dine at a renowned restaurant. They’re also known for their destination shopping - from expansive entertainment centers (here’s looking at you, Destiny USA) to boutiques and specialty shops – and have plenty of professional sports teams to cheer on. With something to please every interest and lifestyle, the Finger Lakes Region is the perfect place to make memories with your loved ones. Not sure where to begin? Browse our calendar of events to see the exciting, entertaining, some even darn-right wacky events taking place across our region.